There was a time — not too long ago — when Bitmojis were reserved for comical exchanges with your Snapchat besties. But now, your personalized digital avatar could mean the difference between securing your next job interview or having your resume fall to the bottom of the pile. That's if a new service from human resource app Canvas takes off: It has teamed up with Bitmoji's owner, Snap, so recruiters and candidates can converse using the quirky characters. It's all part of Canvas founder and CEO Aman Brar's strategy to shake up what he describes as the outdated recruitment industry. "It's an important step forward in transforming the way enterprise recruiters connect with candidates," Brar told CNBC Make It. "People are using avatars to communicate everywhere — at work, in life, and even in texts with coworkers and friends. Now, job seekers can expect to get personalized avatars from the next person interviewing them," he said. Since launching last year, the platform has seen success with its text-based service, which enables recruiters and candidates to discuss positions that are open via messenger apps, including emojis and GIFs. It has already caught the attention of a range of employers – from Fortune 500 companies to start-ups — looking for more effective ways to recruit talent. Health-care business Roche and online restaurant reservation company OpenTable were among the app's early adopters. Today, it is used by hiring managers from Silicon Valley to the south of France. Brar said the addition of Bitmoji will help add a more human element to those early-stage chats. "Recruiters and candidates can now add a bit of personality to their Canvas conversations without disrupting current talent practices," he said. The transition toward alternative recruitment methods reflects a shift in modern communication preferences. According to a recent study by business solutions provider LivePerson, 73 percent of 18 to 34-year-old Americans and Britons would ditch the phone function on their mobile for the texting app. Meanwhile, an earlier Gallup poll found that text messages were the most common form of communication for most Americans under the age of 50. However, whether or not the digital characters will receive the thumbs up remains to be seen. "I certainly can understand and appreciate the desire to humanize the text-message interview process, but I'm not convinced using Bitmoji avatars is the right solution," said Amanda Augustine, a career advice expert at recruitment guidance site TopResume. 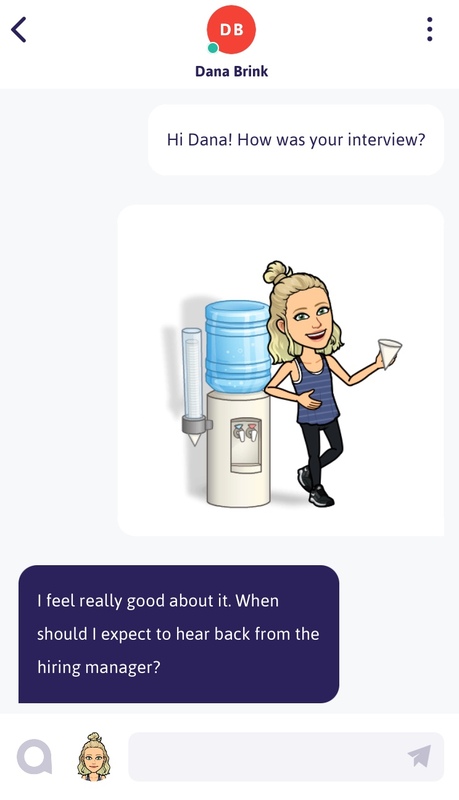 Based on conversations with a number of recent graduates she works with, Augustine said that the vast majority did not like the idea of recruiters texting them with Bitmojis — despite being frequent users of the characters in their other personal conversations. "The consensus was that the communication tool is better suited once a personal relationship has been established, and that if an employer used Bitmojis at the beginning of a 'cold-text' conversation, his or her professionalism — and the legitimacy of the job opportunity — would be called into question," she said. Augustine added that employees who find themselves with the opportunity to use avatars and other informal communication methods in the recruitment process should first fully assess whether doing so fits with the culture of the company. That advice applies to recruiters too. "The way you interact with your candidates during the recruitment and selection process should be reflective of your company's culture and communication style," Augustine said. "If your organization is planning to use this more jovial, informal method of communication, make sure the current work environment values those things as well."